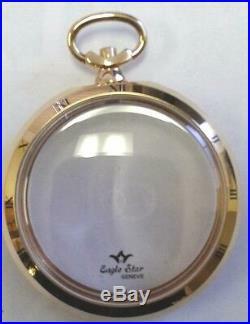 Eaglestar Skeleton pocket watch case fit Swiss made Skeleton Unitas 6497-98 movement or far east made copie, Roman engraved number on front bezel, 5 Micron18Kt gold plate, Swiss made in very good condition This case is made to be used without dial to show the movement front and back, Dial numbers are engraved on front bezels, case made from 3 parts , center, front and back. The item “Eaglestar Skeleton pocket watch case for UT-6497-6498″ is in sale since Saturday, May 20, 2017. This item is in the category “Jewellery & Watches\Watches, Parts & Accessories\Pocket Watches\Modern”. The seller is “juniorbar04″ and is located in Ajax, Ontario. This item can be shipped worldwide.